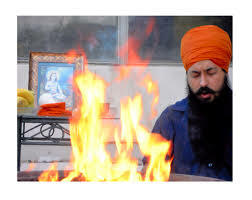 Yogi Bhajan 3HO Foundation & SikhNet​ tantric yoga disciple,Yogi Amandeep Singh,​ spreading fictitious history & lies about the Sikh Gurus! 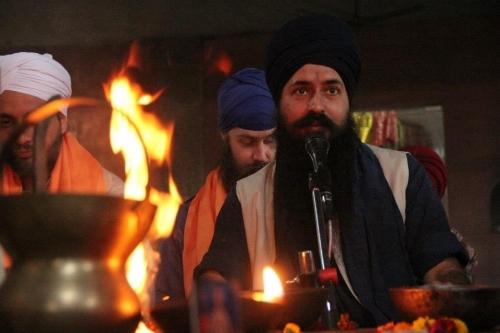 Yogi Amandeep Singh​ says: "The second Guru offered his eldest son to Baba Sri Chand to be initiated as an Udasi yogi. The 3rd Guru offered his eldest son to Baba Siri Chand to be initiated as an Udasi yogi. 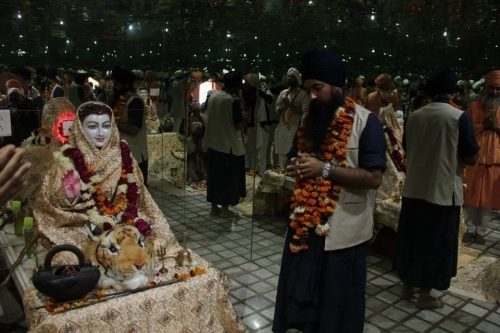 Guru Ram Das offered his 2nd son to Baba Siri Chand to be initiated as an Udasi Yogi. The 6th Guru offered his eldest son to Baba Siri Chand, to be initiated as an Udasi yogi." Gurbani states about baba siri chand: "Nanak's sons did not obey His Word; they turned their backs on Him as Guru." In Guru Granth Sahib on page 967, Satta and Balwand states that the sons of Nanak did not follow the path of their father and that they "turned his ear" against the "ambrosial path" of Nanak i.e against Gurmat (Guru's way) and wandered along other paths, so they were not chosen as his successor or as teachers of Gurmat, but Bhai Lehna was. "The Guru gave the True Command; why should we hesitate to proclaim this? Whatever the Guru said, Lehna did, and so he was installed on the throne." Read following gurubani: ---------------------------------------------------------- ਸਚੁ ਜਿ ਗੁਰਿ ਫੁਰਮਾਇਆ ਕਿਉ ਏਦੂ ਬੋਲਹੁ ਹਟੀਐ ॥ Sacẖ jė gur furmā▫i▫ā ki▫o eḏū bolhu hatī▫ai. The Guru gave the True Command; why should we hesitate to proclaim this? ਪੁਤ੍ਰੀ ਕਉਲੁ ਨ ਪਾਲਿਓ ਕਰਿ ਪੀਰਹੁ ਕੰਨ੍ਹ੍ਹ ਮੁਰਟੀਐ ॥ Puṯrī ka▫ul na pāli▫o kar pīrahu kanĥ murtī▫ai. His sons did not obey His Word; they turned their backs on Him as Guru. ਦਿਲਿ ਖੋਟੈ ਆਕੀ ਫਿਰਨ੍ਹ੍ਹਿ ਬੰਨ੍ਹ੍ਹਿ ਭਾਰੁ ਉਚਾਇਨ੍ਹ੍ਹਿ ਛਟੀਐ ॥ Ḏil kẖotai ākī firniĥ banėh bẖār ucẖā▫iniĥ cẖẖatī▫ai. These evil-hearted ones became rebellious; they carry loads of sin on their backs. ਜਿਨਿ ਆਖੀ ਸੋਈ ਕਰੇ ਜਿਨਿ ਕੀਤੀ ਤਿਨੈ ਥਟੀਐ ॥ Jin ākẖī so▫ī kare jin kīṯī ṯinai thatī▫ai. Whatever the Guru said, Lehna did, and so he was installed on the throne. 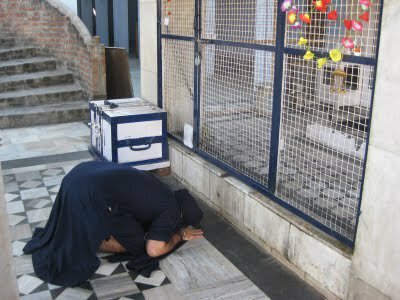 -------------------------------------------------- Complete Shabad, In Sri Guru Granth Sabhib Ji. Please read. Guru Granth Sahib Bani regarding sri chand [punjabi, hindi and english] ਰਾਮਕਲੀ ਕੀ ਵਾਰ ਰਾਇ ਬਲਵੰਡਿ ਤਥਾ ਸਤੈ ਡੂਮਿ ਆਖੀ रामकली की वार राइ बलवंडि तथा सतै डूमि आखी Rāmkalī kī vār rā▫e Balvand ṯathā Saṯai dūm ākẖī Vaar Of Raamkalee, Uttered By Satta And Balwand The Drummer: ੴ ਸਤਿਗੁਰ ਪ੍ਰਸਾਦਿ ॥ ੴ सतिगुर प्रसादि ॥ Ik▫oaŉkār saṯgur parsāḏ. One Universal Creator God. By The Grace Of The True Guru: ਨਾਉ ਕਰਤਾ ਕਾਦਰੁ ਕਰੇ ਕਿਉ ਬੋਲੁ ਹੋਵੈ ਜੋਖੀਵਦੈ ॥ नाउ करता कादरु करे किउ बोलु होवै जोखीवदै ॥ Nā▫o karṯā kāḏar kare ki▫o bol hovai jokẖīvaḏai. One who chants the Name of the Almighty Creator - how can his words be judged? ਦੇ ਗੁਨਾ ਸਤਿ ਭੈਣ ਭਰਾਵ ਹੈ ਪਾਰੰਗਤਿ ਦਾਨੁ ਪੜੀਵਦੈ ॥ दे गुना सति भैण भराव है पारंगति दानु पड़ीवदै ॥ Ḏe gunā saṯ bẖaiṇ bẖarāv hai pārangaṯ ḏān paṛīvaḏai. His divine virtues are the true sisters and brothers; through them, the gift of supreme status is obtained. ਨਾਨਕਿ ਰਾਜੁ ਚਲਾਇਆ ਸਚੁ ਕੋਟੁ ਸਤਾਣੀ ਨੀਵ ਦੈ ॥ नानकि राजु चलाइआ सचु कोटु सताणी नीव दै ॥ Nānak rāj cẖalā▫i▫ā sacẖ kot saṯāṇī nīv ḏai. Nanak established the kingdom; He built the true fortress on the strongest foundations. ਲਹਣੇ ਧਰਿਓਨੁ ਛਤੁ ਸਿਰਿ ਕਰਿ ਸਿਫਤੀ ਅੰਮ੍ਰਿਤੁ ਪੀਵਦੈ ॥ लहणे धरिओनु छतु सिरि करि सिफती अम्रितु पीवदै ॥ Lahṇe ḏẖari▫on cẖẖaṯ sir kar sifṯī amriṯ pīvḏai. He installed the royal canopy over Lehna's head; chanting the Lord's Praises, He drank in the Ambrosial Nectar. ਮਤਿ ਗੁਰ ਆਤਮ ਦੇਵ ਦੀ ਖੜਗਿ ਜੋਰਿ ਪਰਾਕੁਇ ਜੀਅ ਦੈ ॥ मति गुर आतम देव दी खड़गि जोरि पराकुइ जीअ दै ॥ Maṯ gur āṯam ḏev ḏī kẖaṛag jor purāku▫e jī▫a ḏai. The Guru implanted the almighty sword of the Teachings to illuminate his soul. ਗੁਰਿ ਚੇਲੇ ਰਹਰਾਸਿ ਕੀਈ ਨਾਨਕਿ ਸਲਾਮਤਿ ਥੀਵਦੈ ॥ गुरि चेले रहरासि कीई नानकि सलामति थीवदै ॥ Gur cẖele rahrās kī▫ī Nānak salāmaṯ thīvḏai. 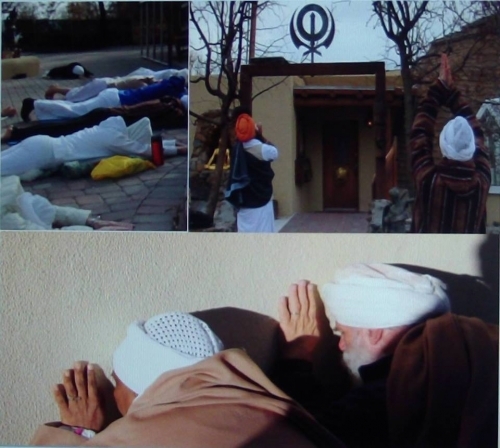 The Guru bowed down to His disciple, while Nanak was still alive. ਸਹਿ ਟਿਕਾ ਦਿਤੋਸੁ ਜੀਵਦੈ ॥੧॥ सहि टिका दितोसु जीवदै ॥१॥ Sėh tikā ḏiṯos jīvḏai. ||1|| The King, while still alive, applied the ceremonial mark to his forehead. ||1|| ਲਹਣੇ ਦੀ ਫੇਰਾਈਐ ਨਾਨਕਾ ਦੋਹੀ ਖਟੀਐ ॥ लहणे दी फेराईऐ नानका दोही खटीऐ ॥ Lahṇe ḏī ferā▫ī▫ai nānkā ḏohī kẖatī▫ai. Nanak proclaimed Lehna's succession - he earned it. ਜੋਤਿ ਓਹਾ ਜੁਗਤਿ ਸਾਇ ਸਹਿ ਕਾਇਆ ਫੇਰਿ ਪਲਟੀਐ ॥ जोति ओहा जुगति साइ सहि काइआ फेरि पलटीऐ ॥ Joṯ ohā jugaṯ sā▫e sėh kā▫i▫ā fer paltī▫ai. They shared the One Light and the same way; the King just changed His body. ਝੁਲੈ ਸੁ ਛਤੁ ਨਿਰੰਜਨੀ ਮਲਿ ਤਖਤੁ ਬੈਠਾ ਗੁਰ ਹਟੀਐ ॥ झुलै सु छतु निरंजनी मलि तखतु बैठा गुर हटीऐ ॥ Jẖulai so cẖẖaṯ niranjanī mal ṯakẖaṯ baiṯẖā gur hatī▫ai. The immaculate canopy waves over Him, and He sits on the throne in the Guru's shop. ਕਰਹਿ ਜਿ ਗੁਰ ਫੁਰਮਾਇਆ ਸਿਲ ਜੋਗੁ ਅਲੂਣੀ ਚਟੀਐ ॥ करहि जि गुर फुरमाइआ सिल जोगु अलूणी चटीऐ ॥ Karahi jė gur furmā▫i▫ā sil jog alūṇī cẖatī▫ai. He does as the Guru commands; He tasted the tasteless stone of Yoga. ਲੰਗਰੁ ਚਲੈ ਗੁਰ ਸਬਦਿ ਹਰਿ ਤੋਟਿ ਨ ਆਵੀ ਖਟੀਐ ॥ लंगरु चलै गुर सबदि हरि तोटि न आवी खटीऐ ॥ Langar cẖalai gur sabaḏ har ṯot na āvī kẖatī▫ai. The Langar - the Kitchen of the Guru's Shabad has been opened, and its supplies never run short. ਖਰਚੇ ਦਿਤਿ ਖਸੰਮ ਦੀ ਆਪ ਖਹਦੀ ਖੈਰਿ ਦਬਟੀਐ ॥ खरचे दिति खसम दी आप खहदी खैरि दबटीऐ ॥ Kẖarcẖe ḏiṯ kẖasamm ḏī āp kẖahḏī kẖair ḏabtī▫ai. Whatever His Master gave, He spent; He distributed it all to be eaten. ਹੋਵੈ ਸਿਫਤਿ ਖਸੰਮ ਦੀ ਨੂਰੁ ਅਰਸਹੁ ਕੁਰਸਹੁ ਝਟੀਐ ॥ होवै सिफति खसम दी नूरु अरसहु कुरसहु झटीऐ ॥ Hovai sifaṯ kẖasamm ḏī nūr arsahu kursahu jẖatī▫ai. The Praises of the Master were sung, and the Divine Light descended from the heavens to the earth. ਤੁਧੁ ਡਿਠੇ ਸਚੇ ਪਾਤਿਸਾਹ ਮਲੁ ਜਨਮ ਜਨਮ ਦੀ ਕਟੀਐ ॥ तुधु डिठे सचे पातिसाह मलु जनम जनम दी कटीऐ ॥ Ŧuḏẖ diṯẖe sacẖe pāṯisāh mal janam janam ḏī katī▫ai. Gazing upon You, O True King, the filth of countless past lives is washed away. ਸਚੁ ਜਿ ਗੁਰਿ ਫੁਰਮਾਇਆ ਕਿਉ ਏਦੂ ਬੋਲਹੁ ਹਟੀਐ ॥ सचु जि गुरि फुरमाइआ किउ एदू बोलहु हटीऐ ॥ Sacẖ jė gur furmā▫i▫ā ki▫o eḏū bolhu hatī▫ai. The Guru gave the True Command; why should we hesitate to proclaim this? ਪੁਤ੍ਰੀ ਕਉਲੁ ਨ ਪਾਲਿਓ ਕਰਿ ਪੀਰਹੁ ਕੰਨ੍ਹ੍ਹ ਮੁਰਟੀਐ ॥ पुत्री कउलु न पालिओ करि पीरहु कंन्ह मुरटीऐ ॥ Puṯrī ka▫ul na pāli▫o kar pīrahu kanĥ murtī▫ai. His sons did not obey His Word; they turned their backs on Him as Guru. ਦਿਲਿ ਖੋਟੈ ਆਕੀ ਫਿਰਨ੍ਹ੍ਹਿ ਬੰਨ੍ਹ੍ਹਿ ਭਾਰੁ ਉਚਾਇਨ੍ਹ੍ਹਿ ਛਟੀਐ ॥ दिलि खोटै आकी फिरन्हि बंन्हि भारु उचाइन्हि छटीऐ ॥ Ḏil kẖotai ākī firniĥ banėh bẖār ucẖā▫iniĥ cẖẖatī▫ai. These evil-hearted ones became rebellious; they carry loads of sin on their backs. ਜਿਨਿ ਆਖੀ ਸੋਈ ਕਰੇ ਜਿਨਿ ਕੀਤੀ ਤਿਨੈ ਥਟੀਐ ॥ जिनि आखी सोई करे जिनि कीती तिनै थटीऐ ॥ Jin ākẖī so▫ī kare jin kīṯī ṯinai thatī▫ai. Whatever the Guru said, Lehna did, and so he was installed on the throne. ਕਉਣੁ ਹਾਰੇ ਕਿਨਿ ਉਵਟੀਐ ॥੨॥ कउणु हारे किनि उवटीऐ ॥२॥ Ka▫uṇ hāre kin uvtī▫ai. ||2|| Who has lost, and who has won? ||2|| ਜਿਨਿ ਕੀਤੀ ਸੋ ਮੰਨਣਾ ਕੋ ਸਾਲੁ ਜਿਵਾਹੇ ਸਾਲੀ ॥ जिनि कीती सो मंनणा को सालु जिवाहे साली ॥ Jin kīṯī so mannṇā ko sāl jivāhe sālī. He who did the work, is accepted as Guru; so which is better - the thistle or the rice? .